Fussie Cat Kibble is a fan favorite of The Pet Beastro! This grain free, potato free, and limited ingredient formula is perfect for cats of all stages of life. Free of some of the most common food allergens including wheat, corn, soy, chicken, potatoes and dairy, creating the perfect hypoallergenic and complete diet! Made in the USA with fresh and high quality ingredients. You can feel confident about giving your furry friend this tasty complete and balanced formula! 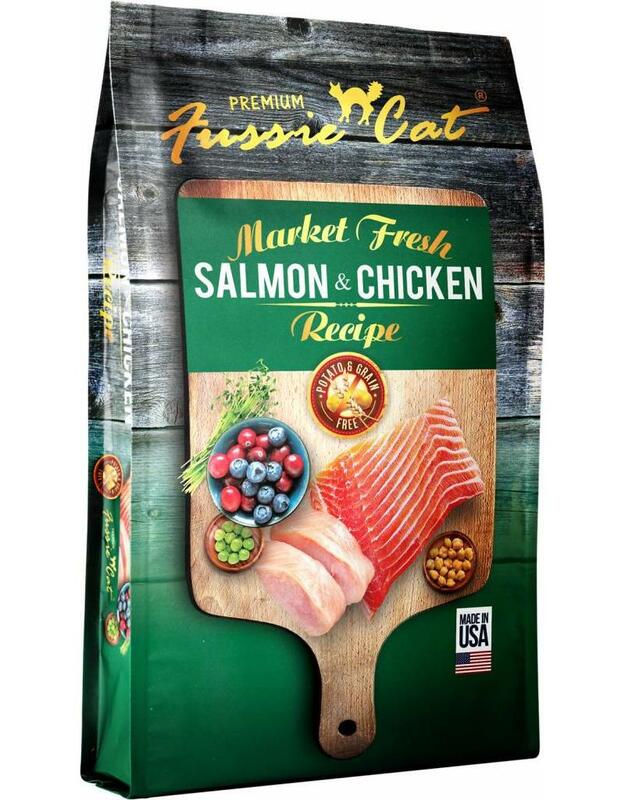 Ingredients: Salmon, Chicken Meal, Peas, Chickpeas, Chicken Fat (Preserved with Mixed Tocopherols and Citric Acid), Turkey Meal, Pea Flour, Natural Flavors, Flax Seeds, Catfish Meal, Salmon Meal, Dicalcium Phosphate, Fructooligosaccharide, Potassium Chloride, Minerals (Iron Proteinate, Zinc Proteinate, Copper Proteinate, Manganese Proteinate, Cobalt Proteinate), Dl Methionine, Choline Chloride, Blueberries, Cranberries, Vitamins (Vitamin A Acetate, Vitamin D3 Supplement, Vitamin E Supplement, Niacin, D-Calcium Pantothenate, Thiamine Mononitrate, Riboflavin Supplement, Pyridoxine Hydrochloride, Folic Acid, Biotin, Vitamin B12 Supplement), Taurine, Lactic Acid, Kelp Meal, Calcium Iodate, Sodium Selenite, Rosemary Extract.